REN Clearcalm Clay Cleanser | £18 // I actually finished this cleanser a while back and I liked it a lot more when I first started using it than when I finished it. When I bought this I had less sensitive skin and was more on the oily side than dry. I wanted a cleanser that would help with spots but one that wouldn't strip my skin and this cream cleanser really worked. I applied it to make-up free skin and removed with a muslin cloth or flannel. Fast forward a couple of months not using it I picked it up again and my skin just didn't react in the same way to it. Instead of feeling clean and calm, it was irritated and dry. If you have dry and/or sensitive skin then I’d perhaps give this one a miss and instead try No1 Purity Cleansing Balm which I've gotten on a lot better with. If you have skin that leans more normal and/or oily then this might be one for you. Despite the good packaging, I struggled to get out the last bit of this cleanser without completely tearing the bottle apart. It’s annoying but not the end of the world. 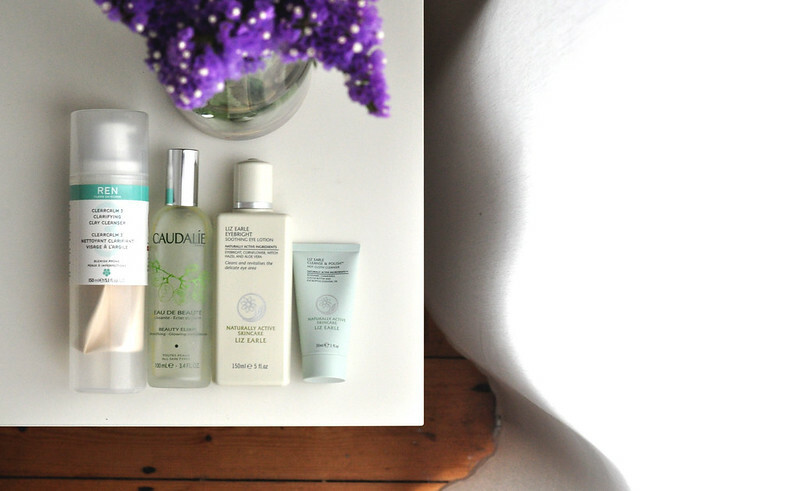 Caudalie Beauty Elixir | £11.50 for 30ml or £32 for 100ml // This is one of the most popular Caudalie products especially in the blogging world and I love it myself. I think I'm onto my third bottle and although for me it's not an everyday toner, it is still an essential product in my skin care routine. On a daily basis I prefer to use something a little more hydrating but when my skin is acting up and I'm getting a few spots then this is what I reach for. I like to spray it onto a cotton pad if I've applied a mask to my t-zone to remove it. I also take a mini bottle of this with me when I'm going on a plane as I find the scent really relaxing and calming. Liz Earle Eye Bright | £10.75 // This is another product I've gone through countless bottles of, noticing a theme here?? This is essentially an eye treatment which you pour onto cotton pads, place onto your eyes and relax for ten minutes so it can work its magic. This is perfect for those who suffer from dry irritated eyes or hay fever, which I do for both, as it feels very cooling and soothing on the skin as well as helps to hydrate the skin. You could also keep it in the fridge during the summer so it’s even more cooling to the eye area. If you have very sensitive eyes then this works really well as a eye make-up remover and it’s what I reach for when the eczema around my eyes flares up. It’s able to take off even the most stubborn eye make-up without irritating or dragging. Liz Earle Cleanse & Polish Hot Cloth Cleanser | £14.75 // This was probably one of the first cleansers I used when I was a teenager and wanted to find a good skin care routine. I had pretty clear skin growing up and this really helped to maintain this and years later when I've had a lot more skin problems, it’s still one of my favourite cleansers. I've been through countless tubes over the years and although I haven’t been using it a lot recently, it’s one I know works well with my skin and I can rely on it. It was also the first cleanser I used that came with a cloth to remove it and I've been using muslin cloths ever since. If you’re looking for a fuss free cleanser that is gentle enough even for those with sensitive skin then this is for you. It really helps to calm the skin as well as keeping it clean and clear without stripping or drying out the skin. It works for all skin types and I've used it when I've had oily skin as well as extremely dry skin. I need to try REN! Such good skincare picks, you've reminded me that I need to get another bottle of REN cleanser, I loved it last time I had it!